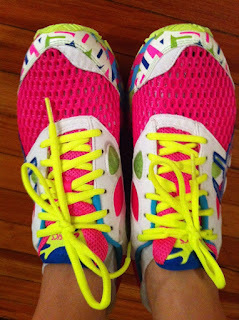 Will Run for Cheeseburgers: New running shoes! It's been over a year since I last purchased a pair of running shoes. I've worn Brooks "Adrenaline" and "Ravenna" for 4 or 5 years. I also had a pair of Asics before then so it wasn't a big surprise to me that I reverted back to a pair of Asics this time around. Ryan and I headed to the Charlotte Running Company to get some advice on new sneakers. I asked my salesperson a ton of questions ... no surprise there. Ryan did not ask any questions and ended up with the same pair of sneakers he's had for the past few years: Saucony "Progrid Guide 5." After conveying to the salesperson that I wanted a lighter shoe to race in, but that would still be good for mileage (up to training and running for a half marathon) he suggested 2 pairs of shoes: Asics "Gel-Noosa Tri 7" and a pair of New Balance (which I don't remember the model or style since I ended up NOT getting them). He was super helpful and guided me in the right direction. Designed for quick transitions, maximum breathability, and a lightweight, stable ride. The vivid color scheme is sure to turn heads, but it’s the performance features that will make your race day unforgettable. Designed for quick transitions, maximum breathability, and a lightweight, stable ride. Mimics connective tissue in the foot by creating tension as foot enters propulsion stage. Employs different densities of Solyte® lasting material in heel and forefoot for improved comfort.